After completing its acquisition of Time Inc. in January in a $2.8 billion deal, Meredith has been leveraging its new assets with its existing properties. Meredith released its 2018 Q4 and full-year fiscal reports today, showing a company at the forefront of digital publishing with strong revenue streams. Full-year revenues increased over 30% to more than $2.2 billion. Among the company’s strongest assets are its digital properties with companywide digital activity bringing in $350 million, a record for the company, from across advertising, ecommerce and paid products and services. Traffic across digital properties increased by 50% in June from the same month a year ago, averaging nearly 135 million monthly unique visitors, while the People/Entertainment Weekly Network recorded record traffic with 60 million monthly unique visitors on average during Q4. Among its portfolio of brands, People.com, Allrecipes.com and BHG.com and MarthaStewart.com were all No. 1 in the entertainment, food and lifestyle categories, respectively. Going forward, the company anticipates increasing scale and efficiency across digital media properties. They reach 175 million American consumers, including 80% of U.S. millennial women, through the use of its proprietary data and branded content and programmatic advertising platforms. The company’s National Media Group digital advertising revenues grew by more than 50% in fiscal 2018, accounting for 35% of the entirety of the group’s ad dollars. Meredith anticipates consumer related sources accounting for 45% of its fiscal 2019 National Media Group revenues. 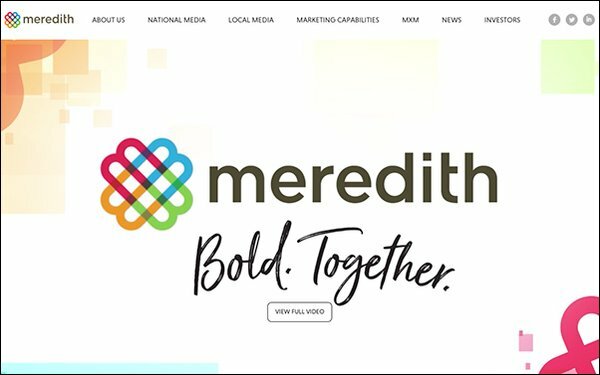 Meredith’s expanded portfolio also allowed it to grow its high-margin consumer revenue activities, including increased revenues from the company’s national brands, affinity marketer Synapse, brand licensing business and growth across ecommerce activities. The company has also detailed how it will successfully integrate its new Time Inc. products to maximize the value of its combined portfolio moving forward. Following the Time Inc. acquisition, Meredith announced it would explore the sale of Time, Fortune, Money and Sports Illustrated, citing a lack of target audiences among its existing customers. Meredith anticipates the sale of these titles to be finalized in early fiscal 2019. In March, the company said it would achieve $400 million to $500 million in cost synergies in the first two years following the Time Inc acquisition. The company reports it is on track to reach this goal, exceeding $500 million through further layoffs and savings across vendor contracts, real estate and other activities.